Did you know you can cook frozen chicken thighs in the instant pot in just 30 minutes? This simple pressure cooker chicken thighs recipe transforms frozen chicken into a hot and delicious meal in no time at all! Place the rack that came with the instant pot into the bottom. Place frozen chicken on top of the rack. They will be on an angle if frozen together, that’s just fine. Place the cover on the instant pot and make sure it’s set to sealing. You can do a natural release or a quick release. 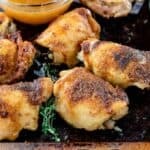 For crispy skin, place chicken thighs onto a baking sheet, brush lightly with oil, and broil for 3 minutes or until the skin crisps and starts to brown. Serve immediately after broiling. Place chicken into the bottom of the crockpot. Use 6 oz. of broth and sprinkle spices on top. Cook High heat for 4-6 hours or until internal temperature reaches 165 degrees.